Smile, Taliban. The Marines are watching you. As mentioned in my new story outlining the current fight in Afghanistan’s volatile Sangin district, Marine forces in northern Helmand province are using tethered “spy blimps” to watch for insurgent activity. 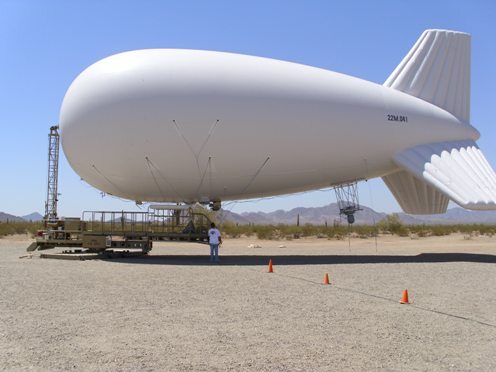 The most common is the Precision Ground Surveillance System, a 70-foot aerostat balloon that floats over many combat outposts up and down Route 611 from Sangin to Kajaki. Army Times colleague Lance Bacon wrote about their capabilities last month. First Battalion, 7th Marines, out of Twentynine Palms, Calif., also has one larger Persistent Threat Detection System, which carries hundreds of pounds of surveillance equipment. The New York Times reported recently that many Afghans find the use of the blimps oppressive. That didn’t appear to be the case in Sangin and Kajaki districts, but maybe it’s because the Marines have used them to such great effect there. With balloons overhead, it’s now rare that an IED is found on Route 611, said Lt. Col. David Bradney, 1/7’s commander. Their use in tandem with High Mobility Artillery Rocket System strikes has formed a fearsome threat: Marines can watch suspected insurgents in action for long periods of time, waiting until they show their motives by exposing weapons hidden in their loose clothing or digging holes for IEDs. Then they light them up with a HIMARS. Put it this way: When outside the wire on foot, it’s reassuring to see two, three even four blimps hanging overhead in the distance. The general rule of thumb is that if a person on the ground can see a balloon, someone on the other end of the surveillance gear can likely see them.